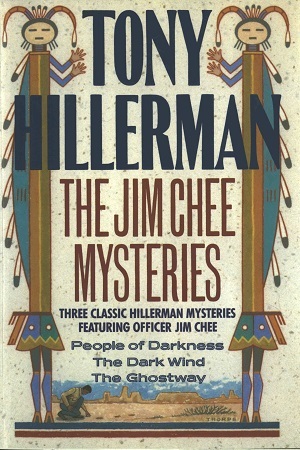 This is the first edition hardback of the The Jim Chee Mysteries: Three Classic Hillerman Mysteries Featuring Officer Jim Chee. This is an anthology of the first three Navajo Mystery Novels featuring Jim Chee as the main character including: People of Darkness (1980), The Dark Wind (1982), and The Ghostway (1984). This edition was published in 1990 by HarperCollins Publishers in New York City, New York. The cover art was illustrated by Peter Thorpe and features a Native American man, presumably Jim Chee, kneeling and inspecting tracks in the sand surrounded by a Southwestern vista. The title, the author, and the image are bounded by two tall multicolored yei figures. Format: Hardback, 24 x 16.1 cm. Binding: Speckled oatmeal boards with a royal blue cloth spine. The author, title, and publisher are printed on the spine in metallic silver.